No Previous Storage • Picked & Delivered Within The Hour • No Order Too Small • Partial Quantities Welcome • Chefs Welcome To Come & Pick Their Own Or Just Visit • EVERY DAY DELIVERY AVAILABLE! • Fee Samples • Locally Grown In Santa Cruz • All Produce 100% Unconditionally Guaranteed. 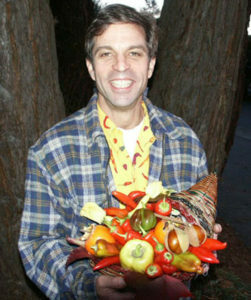 “I also create beautiful cornucopia baskets of various kinds and sizes. This unique presentation is only $20!